Alternators and generators are two devices which generate electricity. An alternator can be called a type of generator. Although both these devices serve the same function, they are quite different in every other aspect. In an alternator, electricity is produced when a magnetic field spins inside the stator (windings of wire). In a generator, on the other hand, the armature or windings of wire spin inside a fixed magnetic field to generate electricity. Alternators are considered more efficient than generators. Alternators conserve energy by using only the energy that is needed, while generators use all the energy that is produced. Alternators have a higher output than generators. When it comes to polarization, alternators and generators are very different. While generators have to be polarized after installation, there is no need for polarization in alternators. Alternator brushes last longer than those of generators. This is because the brushes in an alternator are used only for carrying current to power the rotor and the slip rings they ride are smooth. There is another difference between generators and alternators when it comes to charging. An alternator will not charge a dead battery and if you do try to charge it, there is a possibility that it will burn out. A generator, however, can be used for charging a dead battery. 1.In an alternator, electricity is produced when a magnetic field spins inside the stator (windings of wire). On the other hand, the armature or the windings of wire in a generator spin inside a fixed magnetic field to generate electricity. 2.Alternators conserve energy by using only the energy that is needed. 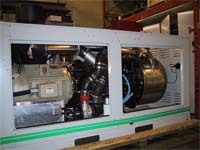 Generators use all the energy that is produced. 3.Alternators produce voltage when needed and generators produce voltage at all times. 4.Alternators generate a higher output than generators. Prabhat S. "Difference Between Alternator and Generator." DifferenceBetween.net. January 20, 2011 < http://www.differencebetween.net/object/difference-between-alternator-and-generator/ >. in the genrator the armature winding consist on rotor and field winding consist on stator. but alternatour is opposite for genratour in the alternator armature winding consist on stator and field winding consist on rotor. I have charged many nearly-dead batteries with the alternator on my car. It output about 14.2V at a low load and mid 13V at high load. Are you saying that alternators don’t handle high loads or heat as well as generators? Generator is a machine which generates DC volage and It is always self excited when Alternator generates AC Voltage and mostly it is separately excited….. The Function of an Alternator and Generator is same both converts mechanical energy into electrical.Alternator generate a.c. and generator is also generate a.c but commutator convert a.c. to d.c. in generator. You people if are so smart why no you can learn English properly. Nothing can be bothering me more for a Dr. or engineer to not in the correct order be speaking English. If I were to begin learning an alternate language I would want the to know the order in which to arrange the words so I didn’t sound like Yoda from Star Wars. May be with you the force. Chris. Speaking good English doesn’t make you a smart person . What is your problem Good or bad English .Don’t like it don’t read it .That simple . Really good inputs for learning basics of generator and alternator.